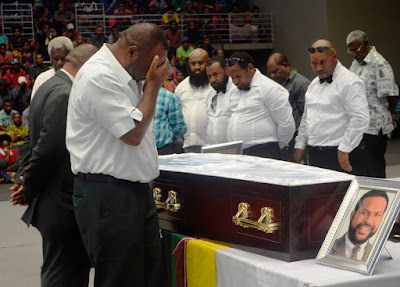 Described as a visionary leader, strong fighter and great warrior, the late Governor of Hela Province Honourable Anderson Pawa Agiru who passed away on Wednesday at the Pacific International Hospital after battling a long illness was given public respect today when his body was taken to the Sir John Guise Indoor complex for public viewing. The complex was packed to filled with supporters, friends and colleagues of the late governor came to pay their respects. The brother of late the late governor Mr Vincent Agiru called on the late governor’s supporters to maintain peace in the time of mourning as this was what honourable Agiru would have wanted.